Republican Gov. Doug Ducey speaks about a variety of issues during an interview in his office at the Arizona Capitol Tuesday, May 8, 2018, in Phoenix. The Republican governor said in an interview with The Associated Press on Tuesday that he was indeed listening to teachers and committed to providing as much funding as possible to K-12 education. He said new state revenue numbers that appeared in early April gave him the ability to push a much bigger pay raise that was put into the state budget that passed last week. The result was a 9 percent average raise for teachers in the fall and a promise for 5 percent boosts in each of the coming two years. Tens of thousands of teachers ended a six-day strike on Friday after the budget passed. The governor's January budget plan included just a 1 percent raise and an extra $100 million for school districts, and he stuck with that plan as teacher revolts erupted in West Virginia, Oklahoma and Kentucky before spreading to Arizona. "I was committed to the budget we presented, not dismissive of the teachers at any point in this discussion. 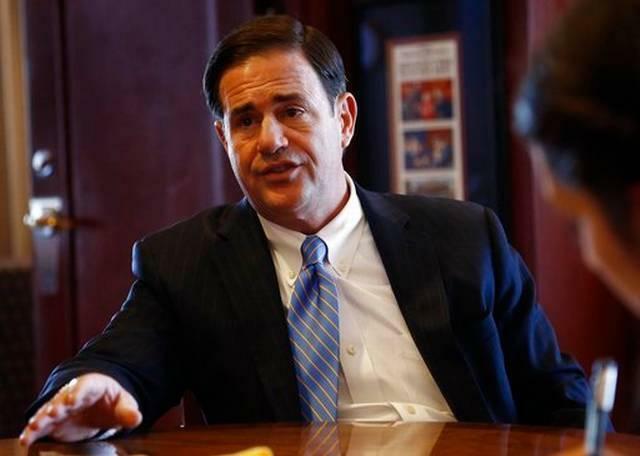 I said I was listening to the teachers and I wanted to get our teachers a pay raise," Ducey said. "But the narrative that the press has taken on is that there was a dismissive tone toward teachers." The governor called the teacher protests "political theater" in an April 10 interview. Two days later, he rolled out his 20 by 2020 teacher raise plan, which included a 1 percent raise given this school year. But he never did meet with leaders of the teacher group that called the strike on April 26. 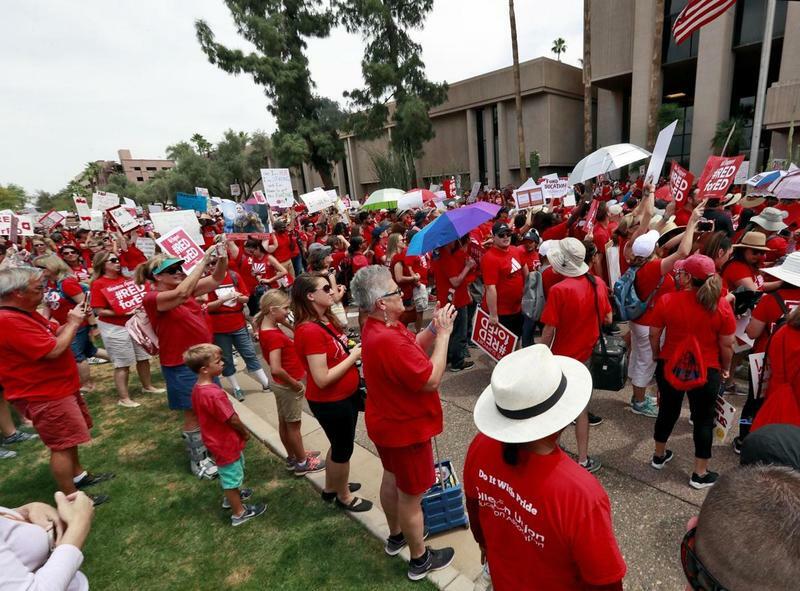 Many teachers who demonstrated at the Capitol — including an estimated 50,000 teachers, support staff and others on the first day of the strike — said they didn't trust the governor to follow though after years of unfilled promises. 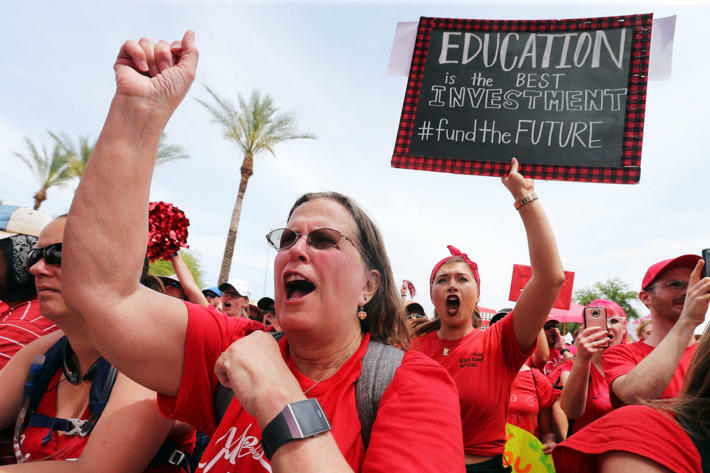 Ducey pushed through a constitutional change in 2016 that boosted funding but didn't come close to restoring recession-era cuts that left teachers among the lowest paid in the nation and school funding in a similar position, but also cut funding in 2016. 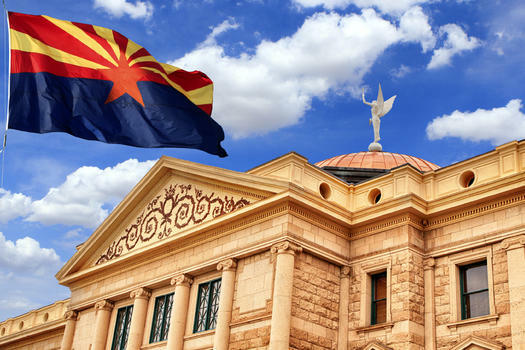 Ducey said he understands the trust needs to be earned. "One, I want to give the teachers a lot of latitude on a lack of trust because of what's happened with government and what's happened over the last couple of decades and how brutal the Great Recession was," he said. "I think every citizen has the right to hold elected leaders accountable. "So I'm not here asking for any more than that they look at the facts and the budget we passed and at what we're able to accomplish in terms of increased funding," he said. "And that we will, like we said on April 12, we're committing to a 20 percent pay increase by 2020. That's what we were able to pass in the budget and that's what we'll deliver on."